We just got a new window cleaning tool in the mail today! This tool has been long anticipated by the window cleaning industry as a whole. This is a water fed brush which is installed on the end of a water fed pole. Essentially, the job of this tool is to agitate and loosen up the dirt and grime on windows, and then the brush is used to rinse all of that dirt and grime off the glass. A thin Hose carries water up the length of the pole and to the brush. The water is then pushed through nozzles installed in the middle of the brush, and onto the glass. The nozzles have been located in the middle of the brush for the last several years. 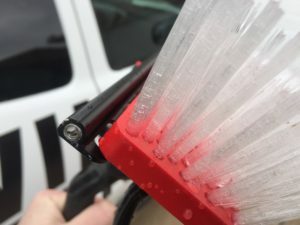 However, there seems to be a move in the window cleaning industry among window cleaning tool manufactures to feature over-the-top spray nozzles or rinse bars. Most window cleaners tend to still prefer the nozzles that are located in the middle of water fed pole brushes. I figure that’s just because that is what they are used to. That said, there is an increasing number of window washers who prefer the rinsing mechanisms to be located over the top of the brush. I prefer over-the-top rinse bars myself. With over-the-top rinse bars, you can get much closer to the top of the frame when you’re rinsing. This method of rinsing also provides greater accuracy which results in a more effective rinsing application. It’s just easier to see where you’re rinsing with an over the top rinse bar. I pre-ordered the water fed brush shown in these pictures, about three or four weeks ago. It felt like an eternity waiting for this thing to come in the mail. There are many reasons I was excited about trying this brush out. One of the reasons I was so excited to try out this brush was the rinse bar itself. This is the first water-fed brush to feature a rinse bar made out of aluminum. 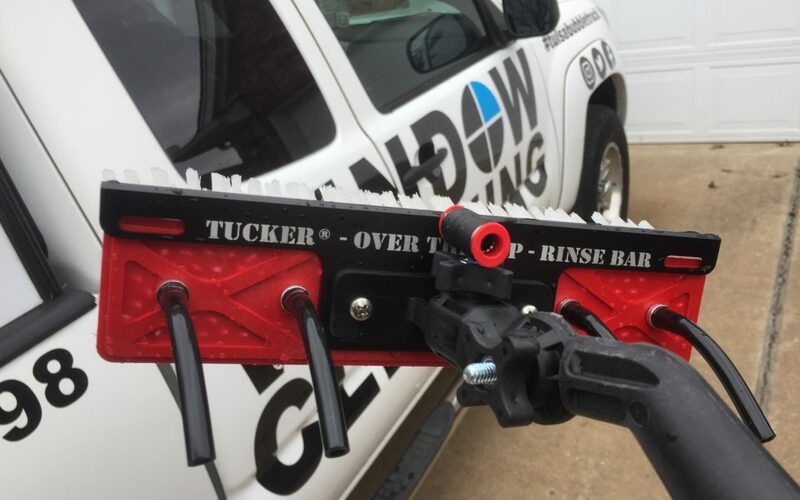 Previous window cleaning manufactures attempted to make rinse bars out of plastic. The problem with rinse bars made out of plastic is that the openings where the water streams out aren’t always consistent. As a result, the streams of water would tend to shoot in unpredictable directions which made rinsing more difficult. You had to really pay attention to which jets we’re shooting water the highest. Otherwise, you would accidentally sprayed the top of the window frame with water which would result in dirty water falling back on the glass. If a rinse bar is made out of aluminum and the holes are drilled on a precise machine, there’s a pretty good chance that all of the spray nozzles are going to be fairly consistent. That means you have more control Over the water being sprayed on the glass. Another reason I was excited to try out this water-fed brush made by Tucker was the side to side swivel. swivel joints on Waterford brushes is another manufacture trend these days. This makes water for the polls much more ergonomically friendly for the user. For the last several years, Waterford brushes were stiff and they had no moving joints. if you had a large window to clean you would have to take a couple of steps back and forth in order to scrub the whole window.That’s not the case anymore with swivel capable water-fed brushes. Now the window cleaner can stand directly in the middle of the window and clean both the left and right side of the large window without having to take a step in either direction. This feature also makes getting too hard to clean windows much easier. I was so excited to try out this brush I immediately cleaned all the windows in my home as soon as I got it out of the packaging.